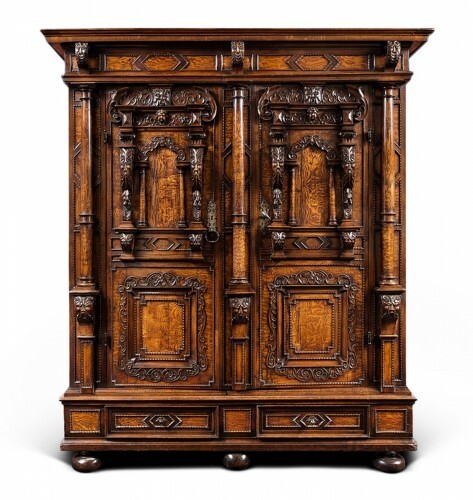 The production of large cupboards with columns was mainly located between Germany, Switzerland and Alsace region during the 16th, 17th and 18th centuries. 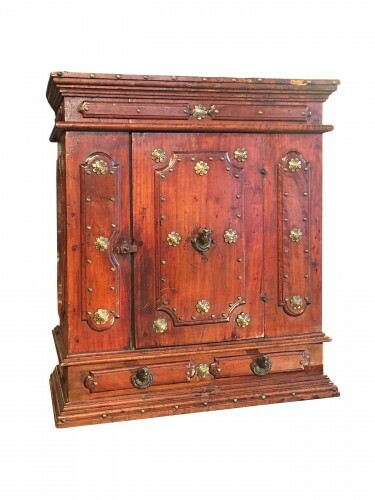 Following precise laws about the decor and the proportions this kind of cupboard is commonly composed of two bodies opening with four door-leaves, standing on a base and topped with a cornice. This formal piece of furniture shows very important dimensions and a rich decor exemplifying the craftsmanship of the local makers. Taking place in a lavish house this cupboard allowed its owner to boasts his wealth. From1544 onwards the Alsatian furnishing evolves with a new wave of classic architecture influences based amongst others on Vitruvius’ treaties. 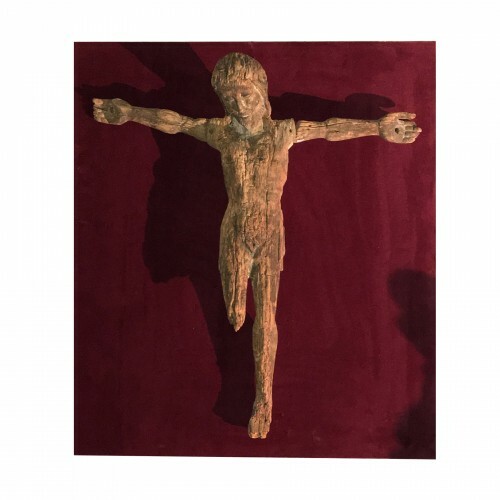 Strasbourg becomes a place where gather artists from diverse backgrounds boosting the absorbtion of the Renaissance art that until then struggled to find its own place in Alsatian’s artistic circles. The local artists use books of models finding inspirations in Italian and Flemmish art. Since then architecture is put at the service of the furnishing and the makers apply diligently its rules. 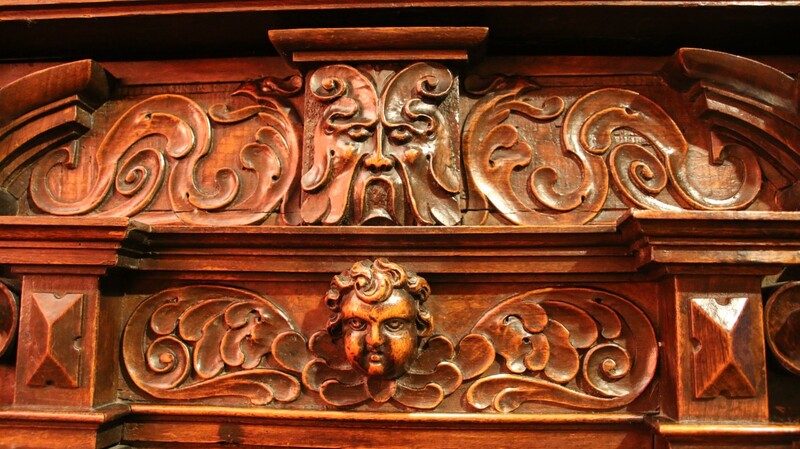 The furniture act as a kind of reduced facade with cupboards adorned by columns, pilasters, cornice and pediment topped windows in the Renaissance style. To the perfection of architecture is added a decor with balanced shapes. Thus, facades are enriched with cartouches, scrolls (Rollwerk), masks and acanthus leaves. Nevertheless this new Renaissance style does not annihilate the local identy and all of the Italian touches are seasoned with a German spirit. This is what makes this regional school of art so characteristic. 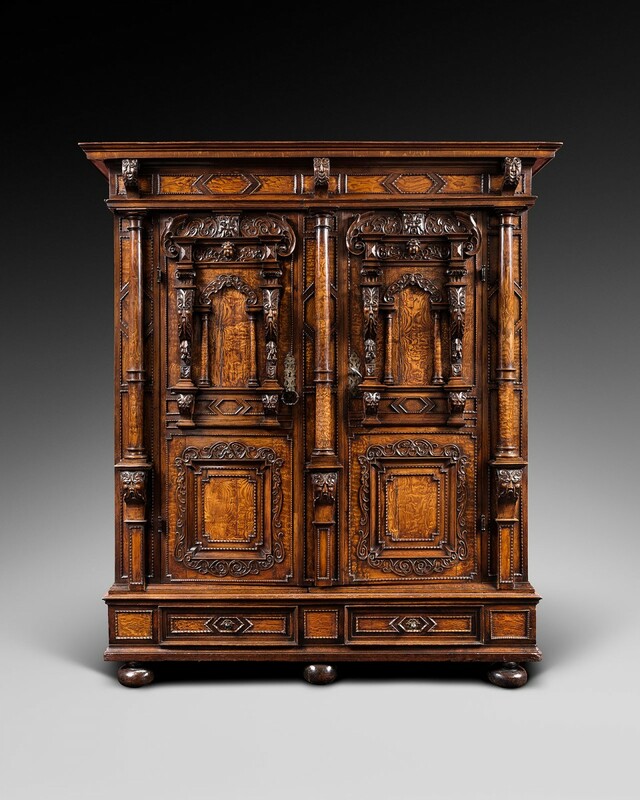 At the beginning of the Thirty Years War (1618-1648) cabinetmakers are seduced by another kind of cupboard. 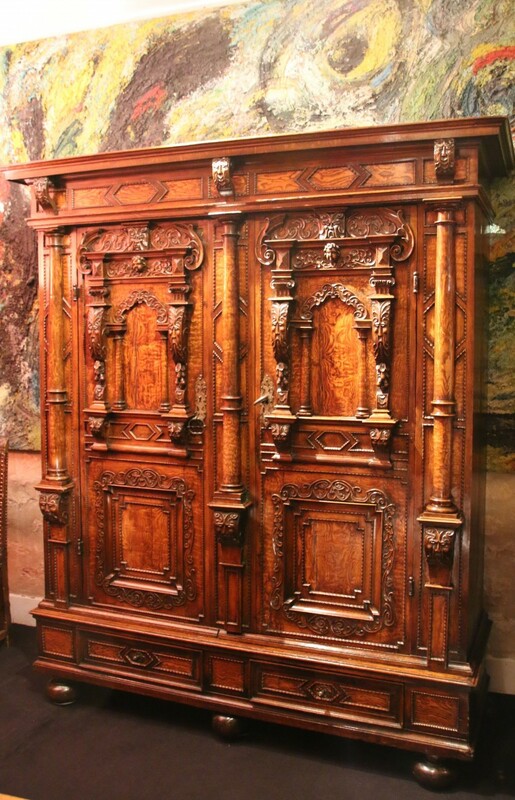 With one body instead of two this cupboard opens with two door-leaves and marks the closure of a typological evolution of Alsatian furniture started in the 16th century. This closet is called Halber Kastern meaning half-cupboard. Its construction illustrates the Alsatian traditions of construction with three parts – base, body, cornice – embedded one above the other. 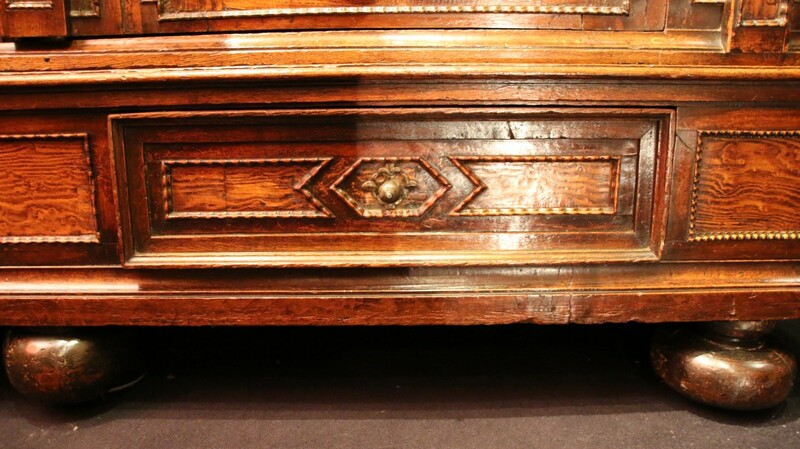 The back of the cupboard is entirely slit vertically with the two parts linked together with a tongue-and-groove jointing. Equally the ceiling and floor boards are made of two parts following the partition of the back. The cupboard is strengthened by mortise-and-tenon locked with a wood pin (Keil). Thanks to this system the wood can work without affecting the structure of the cupboard and making it more enduring. 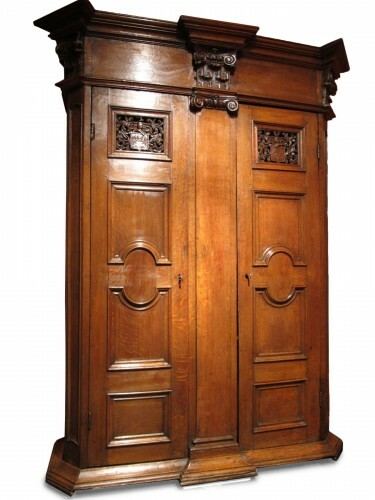 In the same manner as the two-bodies cupboard, architecture plays an important role. Moreover the architectural rigour of the facade is supplemented by a movemented decor characteristic of the newly born Baroque. Flaming edges appear in the ornamental repertoire of the makers thanks to the Geflammter Hobel, a wave plane invented in 1600 in Nuremberg to produce wavy movements on the wood. 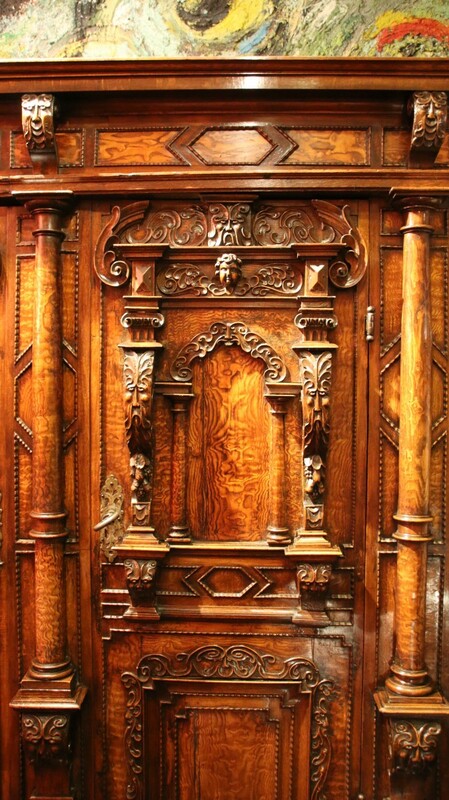 The cupboard we present to you belongs to those Halber Kastern. One-body structure opening with two door-leaves standing on a two drawers base and topped by an overlapping cornice. The facade is divided by three smooth curved columns marked by a double ring in the lower part. These columns stand on foliated masks consoles. 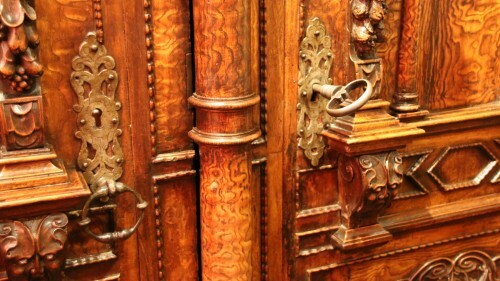 Each door-leave is divided into two registers with a lower one centred by three grip frames and scrolls from which appear masks’ profiles. 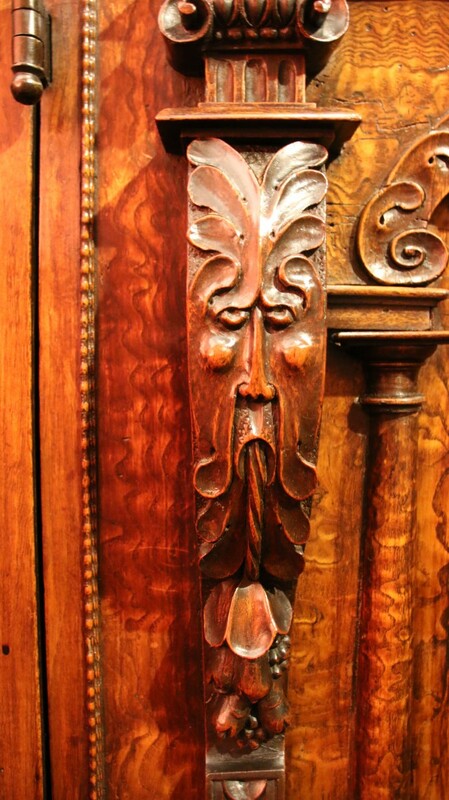 The upper part of the door bears an aedicula decor with Ionic pilasters and foliated masks and fruits on the shaft. 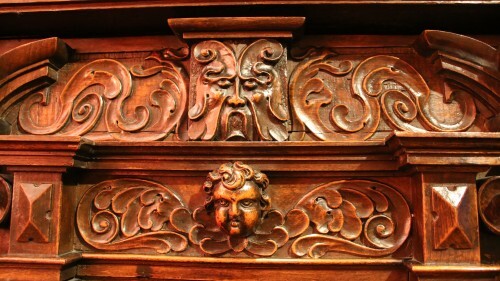 Above it is carved a entablature centred by a putto head in high-relief upon scroll-like wings. The broken pediment is composed of two architectural and vegetal arcs. In the middle appears again a foliated mask amongst vegetal scrolls with eagle-headed finials. 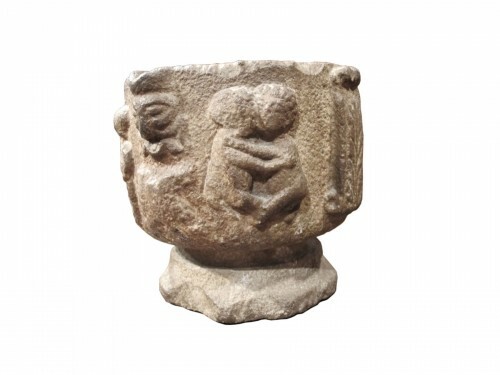 This aedicula hosts a blind Doric arcature with an Auricular style decor and a foliated mask. 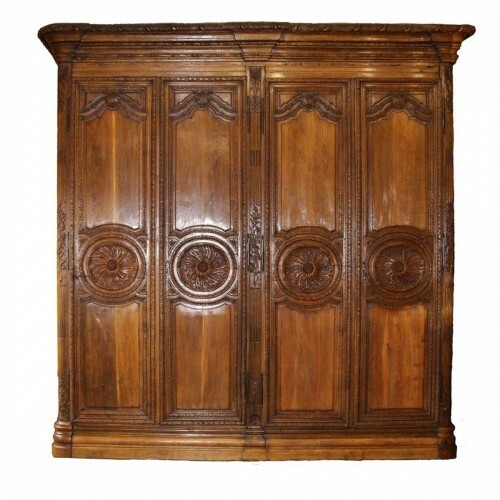 The cupboard is topped by a slightly overlapping cornice supported by three foliated masks consoles. In addition to this remarkable carved decor the flaming edges forming cartouches and geometric shapes give a certain movement to the facade. The great mastery of the craftsmen can also be seen with the use of elm burl animating the surface and evoking marble veins. 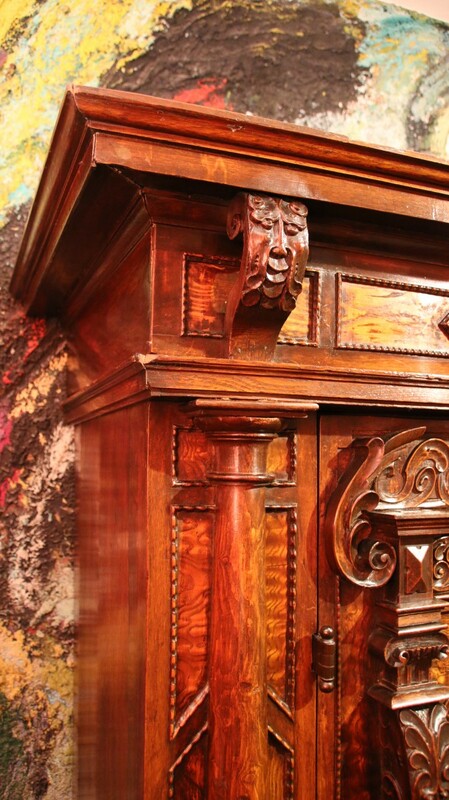 The locks and hinges of this cupboard bear an engraved decor testifying once more of its extraordinary quality. This cupboard is undeniably the work of Alsatian cabinetmakers from the second half of the 17th century. They have achieved an agile combination of the Second Alsatian Renaissance repertoire with the latest Baroque style such as zoomorphic and antropomorphic scrolls, expressive foliated masks, wide open mouths. 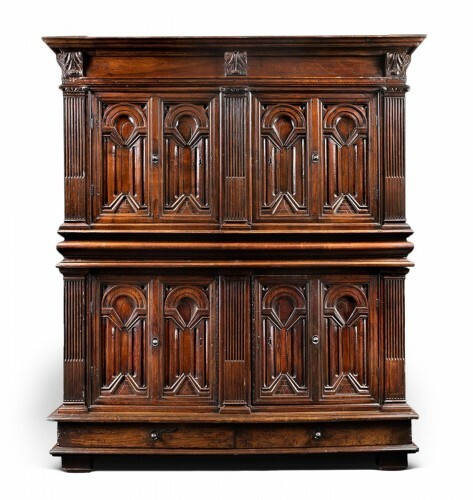 This restrained and balanced decor highlights the architectural structure of the cupboard. 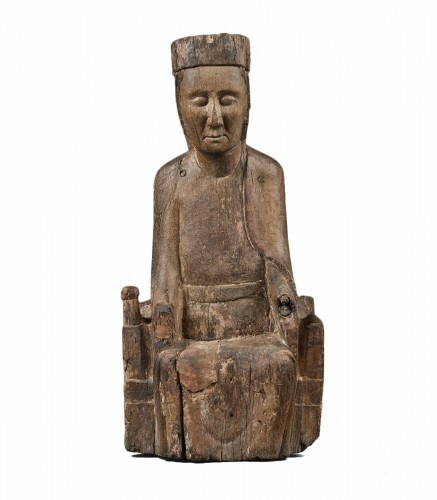 The use of veneered wood adds to the preciousness of this piece, bringing a significant glossy effect to its surface. 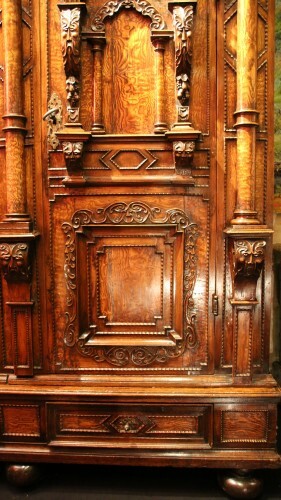 Nevertheless this piece of furniture shows a certain originality with the division of the door-leaves reminding the two-bodies cabinets of the past. The dating suggested for this closet is confirmed by the smooth columns that became unfashionable around 1660-1670 replaced by ringed or twisted columns. The putto head also evokes the second half of the 17th century. 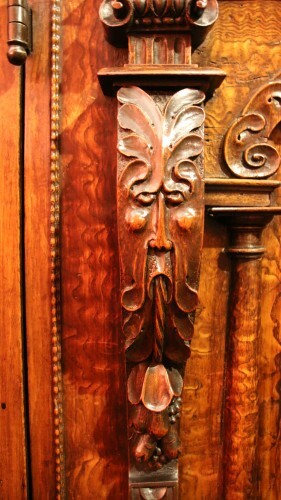 Indeed this motif appears in the secular furnishing as soon as 1650 with cabinetmakers from Nuremberg, Augsbourg and northern Germany cities.